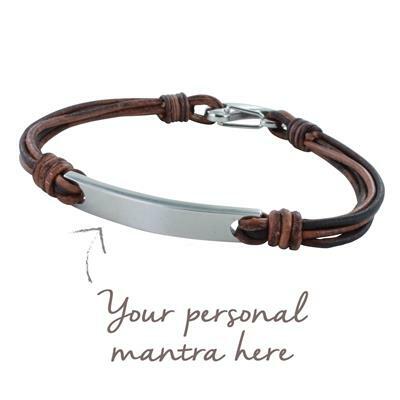 This brown multi-stranded Leather and Stainless Steel Men's Clasp Bracelet is in our myMantra collection, enabling you to have a word or words of your choice engraved onto the Stainless Steel. It has a secure and easy-to-fasten Stainless Steel clasp. We can engrave a word onto the Stainless Steel. Choose an uplifting or inspirational word, which means something to you. We have been asked for words like 'Strength', 'Peace', 'My best self' and 'Love'. Just let us know what you would like, and we can advise you on the engraving. Max engravable characters: up to 12 characters.